A new venue in London’s East End is reinvigorating UK clubland with a refined focus on technical perfection and substantive musical experiences. Blazing onto the capital’s live electronic music scene at the beginning of 2018 with a 27-hour New Year’s Eve launch party, E1 blends simple industrial minimalism with cutting-edge technology to provide the perfect backdrop for a quintessential clubbing experience. Occupying a two-room converted warehouse space, E1 is a location-turned-destination. The brainchild of Yuval Hen and Oren Arush, the venue is an evolution of the founders’ existing Studio Spaces facility – an events and high-production photo shoot destination catering to global brands and the biggest names in fashion and film. Having already run a series of successful warehouse style parties over the past few years, the team wanted to hone their offering; redesigning the space to place the focus on audio excellence and a heightened consumer experience. With this in mind and having used Funktion-One on countless projects over the past decade, the Studio Spaces team knew exactly where to turn. “When it came to choosing permanent sound systems to suit the programming of the space, there was no other option,” says Hinson. The E1 crew turned to long-time collaborators Sound Services Ltd. 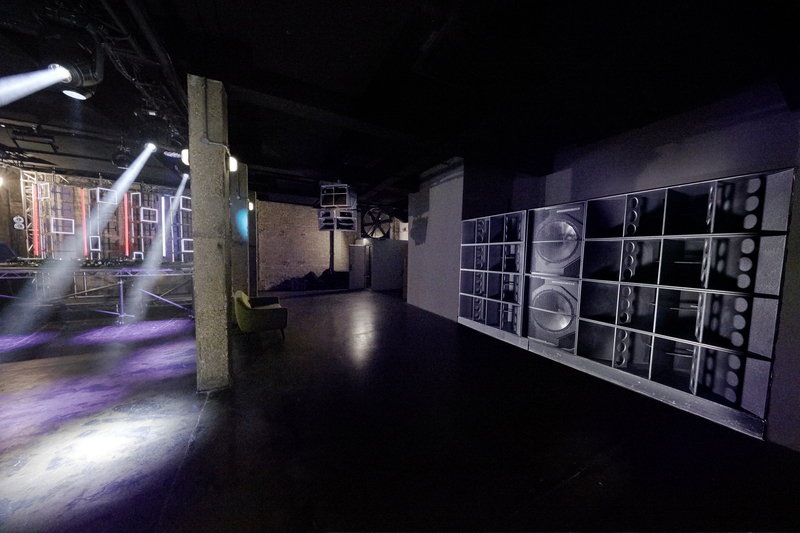 Headed by Curt Gilmore and Rich Cufley, the audio specialists designed and installed a bespoke Funktion-One system for both the main warehouse space and the smaller ‘Black Studio’ room – the latter undergoing a complete redesign based around the audio installation, DJ and dancefloor. The two 5-way systems feature the most recent loudspeaker innovations from Funktion-One, including Evolution 6 mid-highs and the revolutionary BR132 32-inch bass reflex enclosures. To ensure the highest possible audio quality, the systems are powered by Full Fat Audio FF10000 and FF6004 amplification, with digital signal processing from XTA Electronics XO4A/DP448 – all designed and built in the UK. DJ Monitoring in both rooms is provided by the iconic Funktion-One PSM318s. Every aspect of E1 is primed to deliver the perfect clubbing adventure. Alongside the Funktion-One audio, a top-grade lighting rig provides impressive visuals and – leaving no sonic stone unturned – the acoustic performance of both spaces has been optimised by architectural specialists Shaun Murkett Acoustic Consultancy. Following its marathon launch – a cascade of top quality performances from the likes of Ben Klock, Maceo Plex, Rødhåd, Âme and Avalon Emerson – E1 has risen to the promise of its burgeoning reputation with turns from Moodymann and Theo Parrish, plus forthcoming events from some of London and Europe’s best promoters.